Expects to pay the Oshkosh law firm of Steinhilber Swanson LLP $300,000 in fees for handling the case, with another $97,000 going to the accounting firm of CliftonLarsonAllen and $85,000 going to Martin Cowie, who was hired as chief financial officer. Expects to make a slight profit, $200,000, from the sale of a biodigester it financed in Rosendale, which was the largest and arguably the riskiest of the real estate debts it had on its books when it filed for court protection from creditors in August 2017. 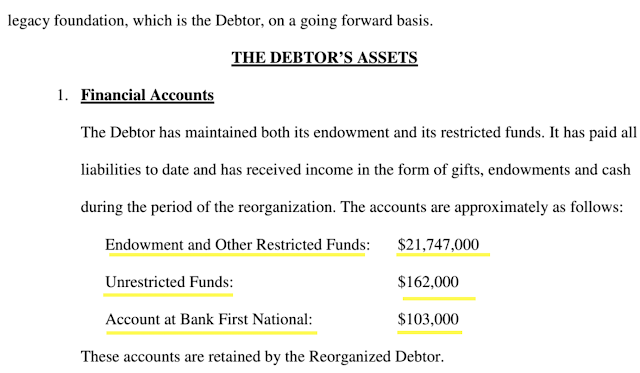 In the new court filings, the foundation provides its side of the story of how it ended up in its financial predicament. A key factor, the foundation says, was the reduction in state support for the UW System over the last decade. At the time of the decline in state support, UW Oshkosh was headed by Richard Wells. Wells subsequently has been slapped with civil and criminal lawsuits for his role in the foundation’s financial dealings. Wells enlisted the foundation in a variety of projects: “upgrading the sports facility, raising funds for the first major academic hall to be constructed on campus in decades and furthering the ‘green initiative’ that the University had embarked on to make the school more environmentally friendly” by financing a pair of biodigesters. Wells also convinced the foundation to purchase his house, which was a historic residence that would be used by him and by future chancellors. Another project that he involved the foundation in was buying and renovating a downtown hotel. These investments marked a change in strategy for the foundation, and the board was uneasy about how they might turn out. Board members, worried that the foundation’s holdings would be jeopardized if some of the projects faltered, asked for written guarantees that the university would backstop any financial problems. They received these guarantees and felt comfortable that the situation was under control because the vice president of finance for the UW System sat in on meetings where the deals were discussed. She was an ex officio member of the foundation’s board and did not express any concerns about the university’s promises to lend financial support, court filings say. According to the disclosure statement, she was asked about the “appropriateness of the [guarantees] and whether they were valid and binding on the university.” She may not have said “yes” but she apparently did not say “no.” According to the court documents, “her acquiescence misled the board in its conclusion that” Chancellor Wells had clear authority to pledge the university’s financial backing. The real estate deals started in 2012, and some of the projects, such as the hotel and the Oshkosh Sports Complex, have proven to be successful. But by the summer of 2016, two of the investments were in trouble. The Alumni Welcome and Conference Center also ran into problems because its “fundraising campaign had come up short,” which led to a loan default. By then a new chancellor, Andrew Leavitt, had taken over, and he was concerned that guarantees to the foundation were not appropriate. By spring of the following year, it appeared that a settlement was close to being achieved. The terms called for the university to acquire the alumni center and for the foundation to sell off some assets.The bank that had lent money for the Rosendale biodigester had also agreed to a settlement, according to court documents. At this point, politics took over, the foundation says. That repudiation ultimately led to eight different legal actions, one of which resulted in a $15 million judgment against the UW System. But “after the elections” of last fall, the UW System asked for mediation to settle the case, the disclosure statement says. The mediation took just one day, and then “the parties put on the record a comprehensive settlement as to the claims between the foundation, Bank First National, First Business Bank, Wells Fargo Bank and the Board of Regents,” the disclosure statement says. Using funds left over from federal grants, the UW System said it would pay $6.3 million to settle the case. UW Oshkosh is expected to pay at least some of this money back over time to the university system.